Peter Jackson has followed up with the second installment in his rendition of J.R.R. Tolkien’s The Hobbit, titled The Desolation of Smaug. It’s a fitting name, because undoubtedly Smaug runs flys away with the film (move over Bilbo). Overall, it’s a significant improvement on part one of the stand-alone book turned cinematic trilogy. But like its predecessor, the movie still suffers from its inherent flaw–Jackson’s obsession to turn this children’s tale into one long drawn out prequel to Lord of the Rings. Once more, E is for Embellish. As before, the film has all the necessary components from Tolkien’s 1937 literary masterpiece: a Hobbit, Dwarves, Wizards, Orcs, Elves, plenty of magic and oh, a Dragon. It’s fun. It’s adventurous. It’s action-packed. But it’s also glaringly obvious: this ain’t The Hobbit. As I’ve stated enough previously, I’m no purist. I understand that changes will occur when adapting a novel to a film. Sometimes I even welcome them. Jackson’s excising of the mysterious Tom Bombadi from LOTR and his expansion of Arwen’s role made all the sense. Books aren’t films. And change isn’t necessarily a bad thing. That being said, films adapted from books can’t be divorced from comparisons to their source. So when a director gives his or her interpretation that dramatically veers away from the source, they’re engaging in a bit of high-financed fan-fiction. The question then is, do these embellishments hurt or harm the original story? Figuring that out, is the hard part. Fast forward to Bilbo and the company of Dwarves, who are fleeing the wrath of a pack of warg riders led by the albino orc Azog the Defiler–Jackson’s conjured big baddie. There is an Azog in Tolkien’s Middle-Earth, but he’s no more than a name and didn’t even survive the mention. Jackson remakes Azog as a key antagonist bent on revenge against Thorin because of a minor amputation incident bout a century back. Key lesson here: Orcs hold grudges. You’d think those eagles could drop them off someplace a bit safer. In desperate flight, the group takes refuge in the lodge of Beorn, a “skin-changer” who at times becomes a ferocious giant black bear. Beorn plays a key role in the overall storyline, so rest assured you’ll see him again. His presence was probably a welcome sight to fans, and a sign that Jackson wasn’t going to jump ship completely. Though, to be fair, the much praised 1977 Rankin-Bass animated version neglected Beorn altogether and still got through the story. Sometime around here, we’re introduced to a new Orc–Bolg. It’s another attempt to reference the book, as Bolg is a key character in the later Battle of the Five Armies. Bolg is actually in Tolkien-lore the son of Azog, who comes to power in his father’s stead. In Jackson-lore however, he’s more presented as a second-in-command, with Azog still very much alive and usurping his role. Thanks dad! Azog himself is drawn further into the mix of things, as he’s summoned away by his mysterious master (dark forces rising! ), and must thus send Bolg to carry out his vengeance on Thorin. Around this time, Gandalf leaves the main company. Wizards come and go as they will after all. As in the book, Jackson sends Gandalf off to find out what mysterious new power is arising in the world. Along the way he’ll meet up with the rather odd-ball Radagast the Brown (we’re thankfully spared too many glimpses of the infamous “rabbit sled”) and the two will go into dark forbidden places to get at the heart of what’s going down in Middle Earth. Mostly they’re trying to catch up with one pesky Necromancer. Dark forces rising! Meanwhile, Bilbo and the Dwarves journey through Mirkwood, which it turns out is kinda like tripping on shrooms. Groovy. There they’ll run afoul of the giant sentient spiders we’ve all been waiting to see, giving Bilbo the first real chance to use his sword Sting (that made up bit where he stabs an Orc in the first flick doesn’t count)–and giving it its name as well. In a bit of creative genius, Jackson has the spiders only speak (at least anything intelligible) when Bilbo slips on “the ring.” In that between realm we can hear them creepily talking about eating and devouring their prey. Bilbo has a minor freak-out moment and goes all berserker on a giant spider because of “the ring,” but he and the Dwarves are really saved by the timely arrival of two Elves. One is the familiar Legolas, who indeed in the books is from Mirkwood but doesn’t appear in the original Hobbit. Being a fan-favorite however, I can see Jackson’s temptation to bring him back–though this fleshier more mature self makes it look like Elves age in reverse. He’s joined by a new figure Tauriel, who does not appear anywhere in Tolkien’s writings. Instead, she’s a creation of Jackson and his wife Fran Walsh. Played by the actress Evangeline Lilly of Lost fame, the character is said to be head of Mirkwood’s Elven Guard. Her first mention a year or so back sent grumblings throughout the Tolkien-verse, as many thought inventing a character out of whole-cloth seemed too far a divergence from the original story. I’m going to disagree however, and say Tauriel’s creation was actually good thing. Let’s face it, Tolkien’s The Hobbit is a sausage fest quest. It’s nearly all-male, all the time. If it’s one thing that we could do to improve the storyline in our more enlightened times, it was adding in a significant woman character. As there are no bearded women Dwarves in the company, or Hobbit-women, and humans play too brief a role, seems the Elves were a good fit. We saw Jackson do the same with the expansion of Arwen’s role in LOTR, which also brought some gender diversity to FOTR. Lilly herself claims to be a long-time fan of Tolkien since childhood, and though feeling a bit of trepidation about fiddling with the original tale, eventually warmed up to Tauriel. “I believe she is authentic, because Tolkien refers to The Woodland Elves,” Lilly says, “he just doesn’t talk about who they are specifically … She’s slightly reckless and totally ruthless and doesn’t hesitate to kill.” The addition of Tauriel also gives us a more nuanced look at the “goody-two-shoes” Elves–more in line with Tolkien’s imperfections. The Elvenking of Mirkwood, Thranduil, shows off true Elven prick-ishness, by reminding Tauriel she’s of a lower class and breed (as a Woodland Elf) for his lovesick son Legolas. There’s also an interesting Elvish-Dwarvish love triangle going on between Tauriel, Kíli and Legolas. So Tauriel, instead of being a hindrance, actually opens up the storyline in a decidedly interesting direction. Our Dwarf company are taken prisoner by Legolas and Tauriel after being rescued from the spiders. Turns out Elves, including Legolas, are hella-racist towards Dwarves–something we knew better in the books, and which is exposed further here. Legolas especially doesn’t like the Kíli-Tauriel flirting–at all. Thraduil (the creepiest Elf ever) ends up having the Dwarves imprisoned until Thorin accepts his demands to retrieve some really dope jewelry from Erebor. They’re saved by Bilbo and that crafty ring, who manages to smuggle them out through river-borne wine barrels. The Dwarves, making their escape, end up securing the aid of one Bard (who is destined for great things) to enter Lake-town. Deciding the original story was too boring I suppose, Jackson fills Lake-town with all kinds of political intrigue. There’s a sniveling Grima Wormtongue type character, who is the underling of the corrupt power-hungry Master of Laketown, disgruntled oppressed town folk, spies, talk of riots, democracy and rebellion. And Bard is set up as the obvious rebel-rogue fighting as he can against the system. In the book, Lake-town ain’t got near this amount of drama. Bard the Bowman and the Master of Lake-town are friends. The town is doing well due to trade with the Elves overseen by the Master, and no one’s really all that disgruntled. Sure they’re wary that there’s a dragon up in the nearby Lonely Mountain, but he hasn’t been seen in forever. The Dwarves and Bilbo are thrown into this new plot twist, at first taken prisoner but then released to go on their way to complete their quest (a plan hatched by the crafty Master and his cohort)–and fulfill Durin’s Prophecy of the heralded return of the King Under the Mountain. The most shocking aspect of Lake-town however might be its apparent diversity. In at least one scene there are several black faces. I didn’t believe it at first. But when I pinched myself, they were still there. Blackfolk in Lake-town? Gimli’s beard! Now they didn’t have speaking roles or names. Instead they just murmured with emotive faces. But they couldn’t be missed–mostly because the camera kept panning back to them, like it does to the few black folks at a GOP Convention. Quite intentional. Who can say what sparked Jackson to add some coffee into Tolkien’s sugary-vanilla universe (outside of veiled Haradrim). Gotta wonder though if someone on the set got hipped to the tumblr People of Color in Medieval European Art. Thankful for small (and it is small) favors I guess. Oh, and wondering where Gandalf is? He’s off searching for the Necromancer (dark forces rising!) of Mirkwood at the infamous Dol Guldur. There, he is eventually found by Azog–who it turns out is working for the Necromancer, a dark disembodied voice. Gandalf manages to get the best of Azog, but then has to confront the dark spirit who puts a serious beat down on the Maiar. Finally, the spirit reveals itself to be (gasp!) Sauron. Da–da-da-DUMM! Not one for subtlety, Jackson beats this over your head in a cheesy scene of a rushing flashing eye wreathed in flames, and Sauron in full FOTR armor. Gandalf is eventually imprisoned, and watches as an Orc army sets out on a march–undoubtedly to become involved in the Battle of the Five Armies. There are bits of the book here embellished with other things. Yes, Gandalf does indeed confront the Necromancer who turns out to be Sauron. However, (as before) there’s no Azog. And if I recall correctly, those aren’t the Orcs that become part of the Battle of the Five Armies (except for Bolg) which really has nothing to do with the Necromancer or Sauron. But Jackson seems dead set on making all these movies stitch together, so there you are. The film speeds up after this–though it really can’t ever be called slow. Bilbo and some of the Dwarves journey to the Lonely Mountain. A few are forced to stay behind, as Kíli got stuck with a poisoned Orc arrow during the barrel-river escape fracas. Finding the secret passage inside, Bilbo is further sent off to find the Arkenstone. And it is here we finally encounter Smaug. Jackson’s Smaug, voiced by the English actor Benedict Cumberbatch (he of the perfect diction) might go down as one of the best CGI created villains in modern movie history. He is everything Smaug needs to be–massive, frightening, haughty, imperious, cunning and terrible. We get to hear the famous lines, in a fashion: “My armour is like tenfold shields, my teeth are swords, my claws spears, the shock of my tail is a thunderbolt, my wings a hurricane, and my breath death!” That alone was worth the price of the ticket! I guess when the universe drops a giant fire-breathing dragon on your doorstep you put it to good use right? Given Jackson’s penchant for embellishment, thinking that he might pass up the opportunity seems naive. Smaug gets lots of screen time–which is good, because he’s such an awesome character. After a while however, I began to think, perhaps he has too much screen time. Smaug talks and talks and talks to Bilbo. But rather than then running out to do his thing upon Lake-town (from where he suspects Bilbo “the thief” to hail) he gets into this whole drawn out battle scene with the Dwarve company. Seems he has it out personal for Thorin as well. And, he’s also down with Sauron (which is never really intimated one way or the other in the book, but why not). 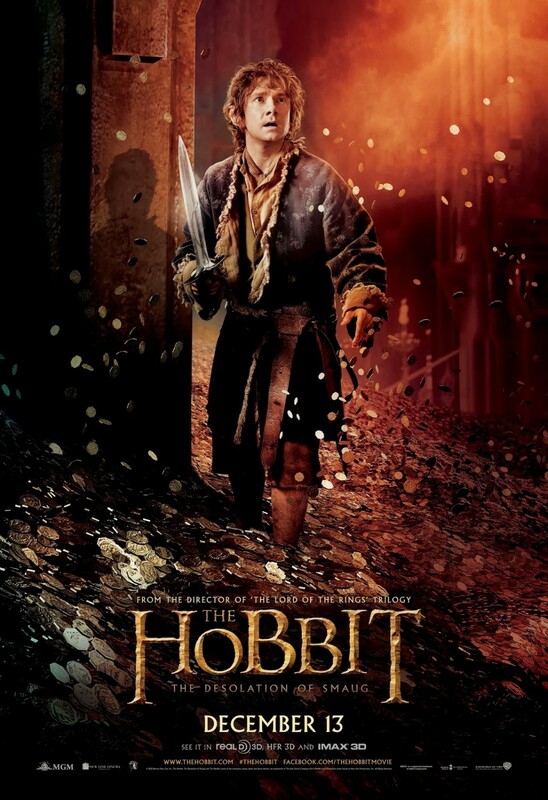 In a series of non-stop action scenes that are reminiscent of Jackson’s King Kong, the Dwarves and Bilbo flee throughout Erebor, trying to hide and fight against the great terrible Smaug. And that’s the movie right? Well yeah, but there’s also this whole attack of Orcs on Lake-town by Bolg. He and Legolas get into a serious tussle. Orcs almost kill the Dwarves there who were left behind. Tauriel shows up (with Legolas) and helps slay them; she also manages to use some Elven magic to heal Kíli’s wounds. Bard has been imprisoned by the sinister Master and his henchmen. The Lonely Mountain is grumbling, and there’s one *pissed off* dragon on the way. The decision to turn a standalone book into a trilogy also seems to require lots of “extra stuff,” and drawn out fight scenes that at times go on far too long. I mean LOTR was actually three books. Can you imagine if Jackson had drawn each one out into a trilogy and we thus had nine movies? There are about three or four stories going on in the Hobbit flicks. And though they all relate (or they are forced to relate) they’re kind of visually draining after a while. I realize this all has a purpose–so the studios can eventually sell me a fully expanded Tolkien-verse 6-DVD Blu-Ray set and TBS will have something to fill its lineup. But the adage “less is more,” remains as true now as it ever did. This entry was posted in Cinematic Reviews and tagged Bilbo Baggins, dragons, fantasy, Gandalf, JRR Tolkien, Lord of the Rings, Peter Jackson, Smaug, The Hobbit, The One Ring by The Disgruntled Haradrim. Bookmark the permalink.